Many, many runners have been at a point where they feel that they just can’t catch a break. An injury happens, heals, and then something else goes wrong. And so on…and so on…and so on. Neely Spence Gracey has experienced her fair share of that cycle. After never having suffered a major injury from 8th grade through college, she suffered 2 stress fractures, a bout with Lyme disease, and a broken kneecap that required surgery all in the space of 2 years. Perhaps most frustrating of all were the flashes of brilliance in between periods of injury. 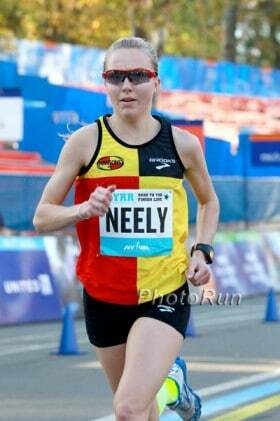 Through all of this, Neely has done a remarkable job of staying positive and motivated. She has also truly come to appreciate the simple act of running. In this interview, Neely and I are going to discuss how she has continued to overcome these injuries and the lessons you can take away. Neely smoked a 5k last fall in Harbor Beach, her and Mickey Davey , I was in 3rd place over 2 minutes back !! Awesome runner and she congratulated me at the end. Hope they return this year, I will try to stay within sight of them for the first mile !!! Congratulations on her progress and achievements! A knee injury can be hard to recover from. I hope she keeps up the good work. She is a true inspiration.